The Lightning Bolt as an item in Mario Kart 8 and Mario Kart 8 Deluxe. The Lightning Bolt (サンダー, Thunder), is an item from the Mario Kart series that appears in Super Smash Bros. Brawl, Super Smash Bros. 4, and Super Smash Bros. Ultimate. Mii is struck by Lightning in Mario Kart 8 Deluxe, shrinking him in the process. The Lightning Bolt's primary effect comes from the Mario Kart series. 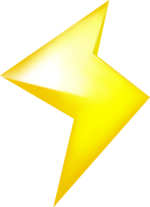 The Lightning Bolt first appeared in Super Mario Kart. Racers at the back of a race have a chance of acquiring a Lightning Bolt (sometimes named Thunderbolt or Lightning), which upon use instantly strikes all other racers, spins them out, and causes them to shrink. Shrunk racers have lowered top speed and may be easily knocked around or even flattened when run over. Since Mario Kart DS, the length of the shrink time depends on what place each opponent was in when the item was used, with those at the back regrowing near-instantly and those are in the front staying shrunk for much longer. In Super Mario Kart, Mario Kart 64, Mario Kart 7, Mario Kart 8, and Mario Kart 8 Deluxe, tiny players can get flattened by normal-sized players. The item cannot backfire as it does in Brawl. It also serves as the logo for the Lightning Cup since Mario Kart: Super Circuit. The Lightning Bolt in Super Smash Bros. for Wii U. The Lightning Bolt appears as an item in Brawl, Smash 4 and Ultimate. When used, it will shrink every other character to Poison Mushroom size, reduce their attack power to 0.7x, make them lighter, and increase the amount of knockback that they take, similar to its function in the Mario Kart series. However, the item can backfire as well, resulting in the player who picked up the item to grow small instead, or make the other characters' size increase (much like collecting a Super Mushroom, only the size-altering effects are amplified even further, causing fighters to grow to 2.4x their normal size, and their direct attacks will deal 1.84x their normal damage). Unlike most other items, the Lightning Bolt requires a character to simply make contact with it in order to gain its effect. Any character affected by knockback while being struck by the Lightning Bolt is still affected by knockback after the shrink/growth occurs. Similar phenomena occurs with the Super Mushroom and Poison Mushroom. An item that goes off the moment you touch it. It may shrink every other character on the screen. Tiny players suffer a reduction in their attack power and become easier to send flying. After a set amount of time, all the characters will return to their normal sizes. In the Mario Kart series, all players but the item user shrunk, and got flattened when run over. In Brawl, if a character uses the Lightning Bolt on Zelda or Sheik and either character Transforms, this glitch makes the size of the Lightning Bolt user permanent until either Zelda or Sheik gets KO'd or picks up another size-changing item. The same glitch does not occur for Charizard, Ivysaur, or Squirtle. The table below displays the damage multipliers that are used whenever players are turned tiny or giant by the Lightning Bolt. These values primarily apply to Super Smash Bros. 4. If there is one thing I've learned from Mario Kart, it's that lightning can strike without a cloud in the sky. Picking this up will hit your foes with a character-shrinking blast of lightning, making them really easy to launch into the distance. If you get struck, you'd best run until the fight is fair again. Don't let sunny weather fool you! Lightning can strike at any time. This mighty force of nature can make you feel small...and actually make you small, too. In this state, you'll be quite weak and easily launched, so just try to stay out of everyone's way until you go back to normal. THEN you can get your own back! Lightning Bolt artwork from Brawl. The Lightning Bolt is the only item which doesn't spawn normally on two different stages: The Great Cave Offensive and Garden of Hope. The largest a character can naturally become without cheating is in Mega Smash, after a lightning backfire. In this state, all size-altering effects are at their strongest, including character voices and sound effects being even deeper than collecting a Super Mushroom in Mega Smash, or after a lightning backfire in a normal match. This page was last edited on March 27, 2019, at 15:23.